Isn’t she a beauty? But unfortunately, we had unknowningly excluded it from our Plant Gallery and Plant Database. Hmmm… time to rectify that omission now! An attractive vine and if given the right growing conditions, Passiflora edulis will be adorned with eye-catching flowers which is the national flower of Paraguay. An added bonus is when the spectacular flowers will eventually develop into edible fruits that have many uses, such as refreshing fruit juices, drinks, added to desserts, cakes, etc. That’s why, the Passionfruit vine is commercially grown and will be as desirable to have in your garden. Similar to the two-in-one gift offer… isn’t that marvelous? We had two potted plants previously in year 2009 and they showed their displeasure being confined in the pots by producing only three fruits during the three-year in residence at our garden. Hence, when they became too straggly and top heavy, we decided to suit their whims by thrashing them, sometime early this year. Nonetheless, we are extremely delighted that Passiflora edulis had graced our garden and given us much opportunities to enjoy its loveliness and capture their gorgeous flowers and fruits. Common Name: Passion Fruit, Passionfruit, Purple granadilla. 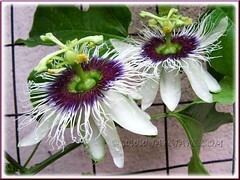 Etymology: The genus name Passiflora, means Passion Flower in English. The name was instituted by the Spanish Christian missionaries to South America who interpreted various structures of the plant as symbolic of the last days of Jesus Christ and his crucifixion. Check at Wikipedia to know more of this religious symbolism and other names adopted in Europe and elsewhere, and added info about this spectacular vine. Origin: Native to Brazil, Paraguay and Northern Argentina. It is also widely cultivated worldwide. Plant type: An ornamental perennial vine that produces edible fruits and lovely flowers. Features: Passiflora edulis is an attractive species of the genus, Passiflora which consist about 500 species of flowering plants. This species, Passiflora edulis is popularly cultivated worldwide, especially commercially for its edible fruits in warmer, frost-free areas. A vigorous evergreen perennial climber that reaches up to about 2.5-3m in height, and needs a strong support. Tendrils are produced in the leaf axils to help its aggressive climb. Its foliage is evergreen but so variable in shape and leaf changes. 1. Different leaf shapes are used as a means to camouflage and keep the insect pests such as passionvine-eating butterflies from finding them. 2. Sometimes, the Passiflora will mimic the leaf shape of other nearby plants too to escape detection from butterflies. 3. Most young leaves differ in shape from mature ones so that the vine can grow unhindered before caterpillars gnaw on the foliage. 4.Some leaves will display tiny bumps (extrafloral nectaries) to mimic butterfly eggs as visual deterrent, hoping to confuse potential butterflies into thinking that they’re already taken by other females. A matured plant will produce free-flowing beautiful flowers that are hermaphrodite (have both male and female organs) and are pollinated by bees. Flowers last only for a day and close up to prepare for production of fruits. Fruits are edible, round to oval in shape and maturing from green to purplish-red. They have a hard covering outside, and inside containing numerous black seeds and enclosed by shiny orange-yellow pulp which are sour-sweet as displayed in the topmost second photo. 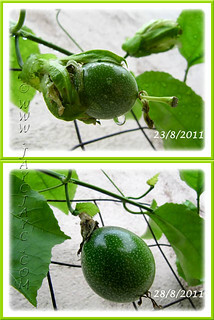 Culture (Care): Passiflora edulis or Passion Fruit grows easily with minimum care. It can be grown in the ground or container, but prefers the former for best growth and fruit production. Moisture: Moderate water requirements. Average water needs. Water moderately and regularly, keeping it evenly moist. More water during hot seasons and when fruits are maturing to prevent them from shriveling and falling prematurely. Less water during cooler temperatures, allowing soil to dry slightly between waterings. Soil: Prefers well drained, nutrient-rich loamy soils. 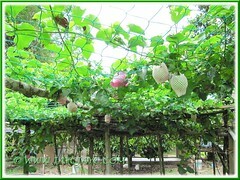 Others: Erect a sturdy trellis or construction to support the heavy weight of the vine and its fruits. Space the vines about 2-4m to enable high fruit production over a short period. Feed once fortnightly with a balanced fertilizer during active growth. A hardy plant that can be pruned regularly to prevent haphazard growth, and to maintain good air circulation for plant health and productivity. Relatively free from serious pests and diseases, though attractive to caterpillars that feed on its foliage. For subtropical and temperate regions: Hardiness: USDA Zone 10. 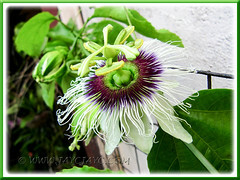 Passiflora edulis or Passion Fruit is sensitive to frost and prefers subtropical and monsoonal weather. In non-hardy regions, plant them in containers to overwinter plants indoors or in greenhouses. To know more about planting in subtropical and temperate regions, just follow the external link by ‘Plants For A Future’ as provided at the end of this article. Propagation: By seeds germination or from herbaceous tip/stem cuttings. If you wish to know how-to propagate by cuttings, just follow the link given. 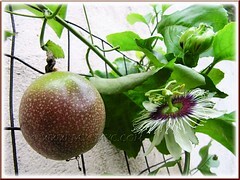 Usage: For added beauty and interest to your garden, Passiflora edulis or Passionfruit can be landscaped to cover and decorate garden fences, trellises, arbors, pergolas and arches or espaliered on walls with wire-netting. Moreover you can enjoy their catchy flowers and use their edible fruits that have many uses, such as a refreshing drink, add to fruit juices, desserts, cakes, and ice-cream, etc. It is popularly grown commercially for its fruits and leaves. For nature lovers, use them to attract wildlife, such as bees, butterflies and birds to your garden. In non-hardy regions, plant them in containers to overwinter plants indoors or in greenhouses. To know more about its uses by different countries, just click on the external link below by ‘Wikipedia’. Wonderful write-up on P. edulis! Wishing you and family a Happy, Healthy New Year 2013! Thanks for your generous compliment and wishes, A. Belle! Propagation by tip or stem cutting is a better alternative. Best wishes to you and family for a joyful and successful year ahead, from John and I. God bless.